Shimadai, a grouper ( probably Chilodactylus zonatus ) and ainame, greenling ( Hexagrammus otakii ). Together with red-berried nanten. Poem by Kanshunro Nushibito. 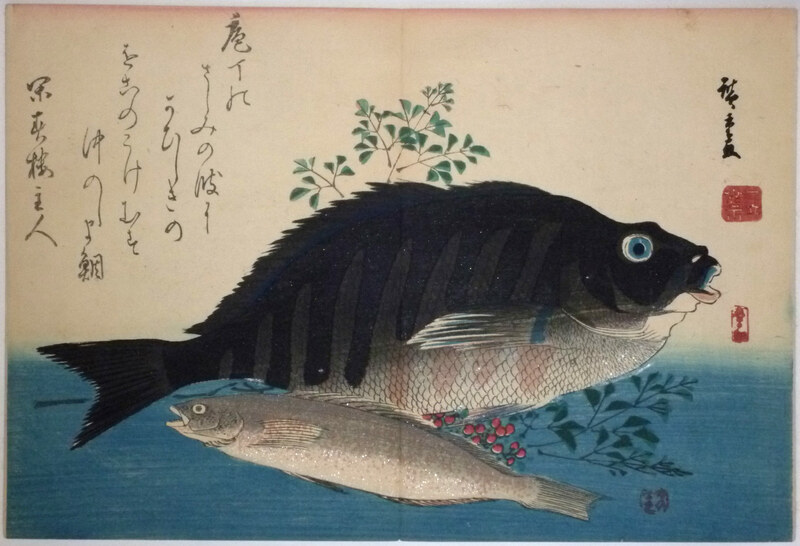 From the second series of nine fish prints published c 1840 – 42 by Yamasho ( Yamadoya Shobei ). Ex collection Felix Bracquemond ( 1833 – 1914 ). Japonisme in France usually starts with Bracquemond who was a graphic artist and designer and also worked with ceramics. He discovered Hokusai’s Manga in 1856 and used it as source material. He produced a number of etchings, often of birds and some with fish, obviously partly inspired by Japanese prints, including Hiroshige’s prints. So, it’s reasonable to suppose these were the actual prints he used as inspiration. Bracquemond’s initial: “B” accompanied the prints. Very good impression, colour and condition. Centre fold as per usual. Signed Hiroshige ga.